I'm sure most of you have seen the Disappearing Pinwheel block and maybe even watched the video on it. Or perhaps even made a quilt with it. I haven't yet but I've certainly wanted to. Just in case you've missed it somewhere along the way, here's a popular tutorial video from Missouri Star Quilt Company. Even though I haven't made an entire quilt, I have played around with the block. Of course you need to start with two squares the same size. In my case I used a 10" square or you can use a layer cake precut as suggested in the video. I sewed all the way around them using a 1/4" seam allowance. Then I cut them in half diagonally and then without moving them, cut them again in half diagonally the opposite direction. Sew it together to get a pinwheel. Now measure your pinwheel and divide by 3. In my case it was 13". 13 divided by 3 = 4.33". Now I know that's an odd measurement but ..... I found if you mark it on your ruler with a strip of blue painter's tape, you won't have to search for the mark every time you want to make a cut. Sorry I forgot to take a picture of that. Now cut your pinwheel block apart (twice on the width and twice on the length). Now here's where the magic begins. I flipped and got this with the dark fabric on the outside, a version of a churdash block. Or the reverse of this one with the light on the outside. 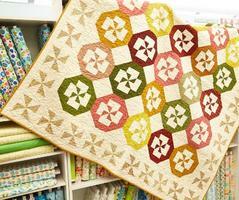 There is also a tutorial on this one from Missouri Star Quilt Company. 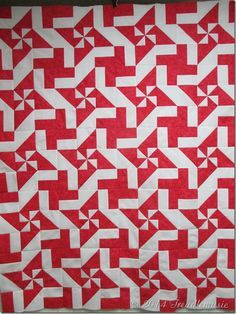 Lots of this variation make a quilt like this one Missouri Star Quilt Company made. Flip again and get this block, which is the original block from the disappearing pinwheel tutorial. Or the reverse of it. There is also a tutorial for another version of the disappearing pinwheel from Missouri Star Quilt Company. I found this one on Pinterest here. Just keep turning and playing to get all kinds of possibilities. Cool ideas!! I love pinwheels and these blocks have fired up my imagination!! Pinwheels are one of my very favorite blocks. Amazing what can be done. I'm ready to get started on other blocks and see what will happen. Great share and thank you so much ... Great fun! !